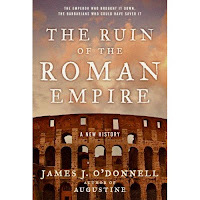 Jim O'Donnell will be at Politics and Prose bookstore on Saturday, September 20 with his new book, The Ruin of the Roman Empire. The bestselling author of Augustine: A New Biography will discuss his fresh take on a not-so-well-known story, and sign books. 1 p.m. A map to Politics and Prose is here.